Risotto is a famous Italian speciality that is popular around the world. It is essentially a rice dish that has a delicious creamy texture. Popularly, it is cooked in meat or seafood broth, but it also has vegetarian varieties. In fact, it has a lot of varieties and preparation styles. Rice has been a staple in Italy for centuries. It is one of the major crops. Risotto comes from the northern parts of Italy and has an interesting legend surrounding it. While nobody knows, who invented the risotto, a popular story circles back to a wedding. A local rice dish was part of the wedding feast in Flanders. A young apprentice of the glassblower was using saffron as a pigment in his work. He added the saffron to the rice and ended up creating an early version of the risotto. Risotto has a lot of local variations in its recipes. Butter, red and white wine, parmesan cheese are common ingredients. It is also often made with beef or bone marrow. Depending on the ingredients, the texture, taste and thickness of the broth changes. 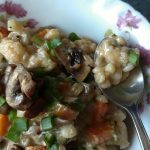 Some styles of risotto are almost like soup! This may even explain why risotto is often served as the first course instead of the main. I have however used Pearl Barley to make my risotto then the Mad Scientist took over and I put in a bit of this and need to finish this and that resulted in this Fusion Dish. Pearl barley has a grainy feeling and once you get used to the taste you will love it. I have used Pearl Barley in my attempt to include healthy grains in our diet. This is a great replacement for rice, a grain my Husband want to avoid needless to say after the initial hesitation he did take a second helping. That is a big YES from him. He will not praise me at home but when we go out he tells his friends that I” cook well” and discusses some of my foods with them. 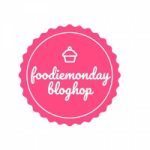 This Monday for FoodieMondayBloghop Kalyani out host has challenged us in #186 DesiTwist take a foreign recipe and give it an Indian Twist she says. Now the reverse is easier but what is life without a challenge. 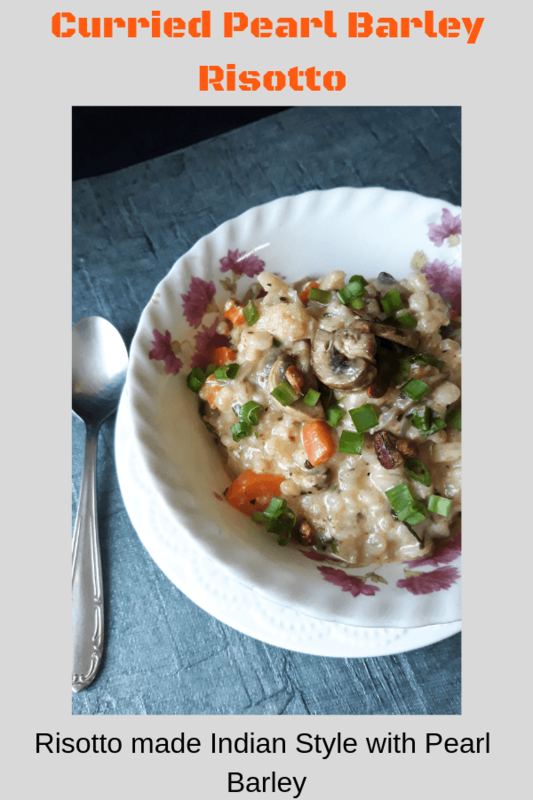 Kalyani a great friend is our Mom Chef blogs at Sizzling Tastebuds and if you want some healthy, gluten-free and vegan stuff with whole grains yet keep food interesting for your family this is the place you need to head to. I had actually told Kalyani that due to some problems I will not be able to participate but then I could not get the “kida” out of my head. This is my take on the theme. I am updating only one picture currently will update the rest later. Risotto is a Classic Italian Dish made from rice and is very creamy in texture. Taking into account that we are trying to cut on certain foods I made this risotto with a twist. In a thick bottomed pan ( I used my pressure cooker ) heat the oil. Add the garlic and stir fry till golden brown. Drain and set aside. Fry the mushrooms drain and set aside. In the same oil add the onions fry till soft on medium flame. Take care it does not burn. Add the barley and stir fry till well done. Add 2 -3 tbsp water and mix well. Add 2 ladles of the stock/water/milk and stir till the liquid is absorbed. Add more water or stock till the barley is cooked and reaches the consistency you like. Once the right consistency is reached add the vegetables, pulao masala, lemon juice, salt and pepper. Add the mushrooms, get off the gas and mix well. Serve immediately. You can serve with some salad but we had it with Daal. I can’t tell you just how much I love this recipe! 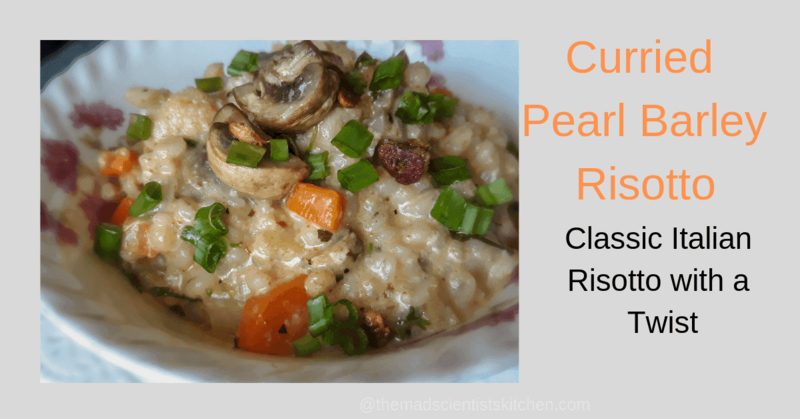 I have always wanted to try making risotto at home, and this is just the perfect recipe for me. It’s so awesome that you have used pearl barley here, instead of the regular rice. Thanks, Girl. I love your delicious comment you see I was hesitant about its acceptance. Blushing here with your praise. Tag me Kalyani when you make it. Nice and healthy risotto..Barley takes a long time to cook. I make porridge with it but never tried risotto. Yes, Shobha. Thanks to you I realised that I have not said I used cooked barley. I have updated the recipe now. I’m a big fan of risotto though have not made it at home as yet. Using pearl barley for risotto and then adding Indian masala, a twist upon a twist. Great recipe. Now contemplating whether to make the risotto with the little pearl barley I have or to make this risotto. Thanks, Mayuri. You can try some time later when you go back home. 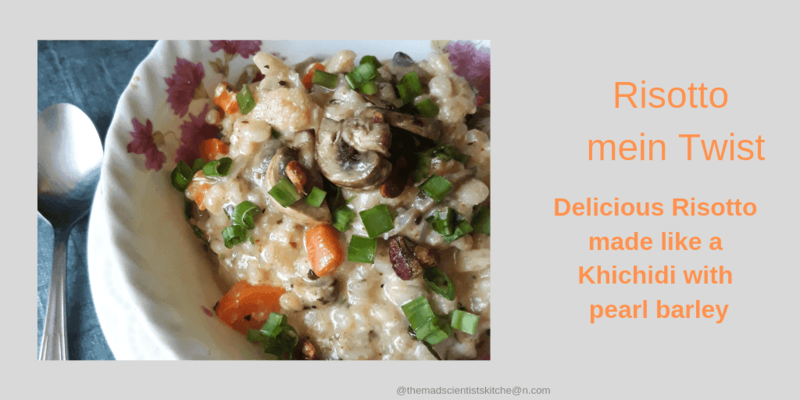 I am always apprehensive about making Risotto at home with your recipe I can give Risotto a try.. Loved the use of Indian barley in the Italian dish!! Never tried risotto at home. But your recipe tempted me to try. You have used pearl barley instead of rice and made the dish super healthy. Loved this fusion Archana. This is a perfect fusion dish di ! Who would have thought of making an Indian version of rissoto with pearl barley . The platter looks very inviting ! Use of pear barley is quite interesting to be used in risotto Love the idea !! Pearl barley risotto sounds interesting. Absolutely amazing to see you come out with such healthy and yummy recipes. Fabulous!! This risotto looks so delicious and inviting .. a very healthy one too. I love the fusion touch you have given this risotto. It looks delicious. That is a real fusion dish arch! Love the Indian twist to the delish risotto! Looks hearty! That looks yum and healthy. With mushrooms in it, it must have added a taste and a bite to the barley.